Most of us have anthologies of daily meditations for the Lenten season. Watch for the Light serves this purpose for Advent and Christmas. Rather than a collection of a single author, 50 are represented, from classical Christian writers starting with St. John Chrysostom (4th century) through contemporary writers such as T. S. Eliot, Madeleine L’Engle and Henri Nouwen. There are scholarly essays by theologians, selections from fictional works and a number of poems. Contributors’ religious backgrounds run the gamut from the liturgical faiths to Quaker, Presbyterian, Mennonite and Evangelical. 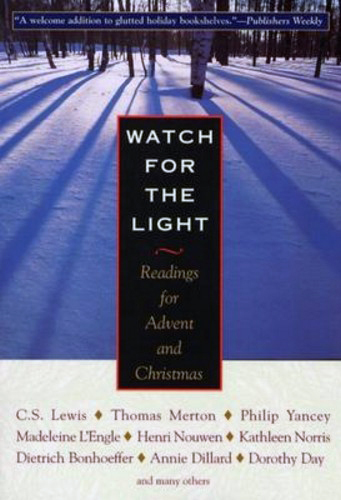 It is indeed a cross section of literature tied together by the recurring themes of Advent, expectancy and watchfulness. Advent has increasingly become my most treasured season of our church year, an antidote to the unbelievable commercialization of Christmas which begins earlier and earlier every year. Advent services with their anticipatory lectionary readings, the blue vestments, the weekly lighting of an Advent candle help keep me centered and looking ahead to the great gift of God’s coming into our midst. Equally important are daily devotions which have for several years included each day’s selection from Watch for the Light. It is not always an easy book. I face 13th century German mystic Meister Eckhart’s essay with great trepidation for a good deal of it is nearly incomprehensible to me and, naturally, it is one of the longer readings. But every year, plugging away, I find something that makes more sense than the year before. I’m also comforted that a friend with seminary training shuddered when I told him I was reading Eckhart. On the other hand, the chapter from Gail Godwin, ‘Genealogy and Grace,’ T.S. Eliot’s poem, ‘Journey of the Magi,’ and the C.S. Lewis selection, ‘The Grand Miracle’ delight and stimulate as do so many others. Two selections move me to tears each year and bring home, like no others, the essential meaning of Advent. They are by Dietrich Bonhoeffer and Alfred Delph who were jailed by the Nazis and executed during the last terrible days of World War II when Hitler was clearing the prisons before allied armies could liberate his enemies. Their essays were written in 1944 during what was to be their final Advent on this earth. In spite of the hardships they were enduring and while undoubtedly knowing they were unlikely to survive, their essays, each very different from the other, reverberate with hope for the world and the certainty of Christ’s love for mankind. Since Advent begins on different dates Watch for the Light’s readings start on November 24 and end on the day after Epiphany, the traditional close of the holidays. It may be read here or there or be used for daily devotions, and I recommend it as part of your Advent discipline. But, a warning: the author for December 1, the first day of Advent this year, is Meister Eckhart. Since December 1 is indeed a Sunday, consider meditation on that day’s lectionary readings and begin your trip through Watch for the Light on December 2.